« Välkommen till Stasi och KGB land – 3! Global Warming: Has the Climate Sensitivity Holy Grail Been Found? Här kommer en mycket intressant analys av Roy W. Spencer, Ph.D,. ”Chaotic Radiative Forcing, Feedback Stripes, and the Overestimation of Climate Sensitivity”. Som han den 25 juni (uppdatread idag) skickade in för publicering i the Bulletin of the American Meteorological Society. Vad det hela handlar om är återigen hur osäkra klimatmodellerna är och på vilken lösan vetenskaplig grund de vilar. I det här fallet rör det sig om molnbildning, energimängder, satellit data och “climate sensitivity”. Det är alltså dessa voodoo modeller som Global Warming Hysterikerna avgudar och på vars altare de är bereda att offra VÅRT välstånd och ekonomiska framtid. Se även mina inlägg: IPCC Expert Reviewer – The present warm phase is no more than one of those naturally driven cycles., This is what the Global Warming Hysteria is all about – 0,03%!, The Greenhouse Conspiracy, A Climate of Belief – The Story of Climate models! Validation, Evaluation and Exaggeration from the IPCC, Has Global Warming Research Misinterpreted Cloud Behavior?, Honest Statement Of Current Capability In Climate Forecasts, Tropical Water Vapor and Cloud Feedbacks in Climate Models, Basic Greenhouse Equations ”Totally Wrong” – ytterligare ett anförande från konferensen i New York, Hey, Nobel Prize Winners, Answer Me This, The Sloppy Science of Global Warming!, IPCC models are incoherent and invalid from a scientific point of view!, But the forecasts, especially for regional climate change, are immensely uncertain!, There will be no more warming for the foreseeable future. ROBUSTNESS AND UNCERTAINTIES OF CLIMATE CHANGE PREDICTIONS, Has the IPCC inflated the feedback factor?, Climate change confirmed but global warming is cancelled, Why multiple climate model agreement is not that exciting!, Open letter to IPCC to renounce its current policy!, Average Day By Day Variations Of The Global And Hemispheric Average Lower Tropospheric Temperatures, Scientists Reveal Presence Of Ocean Current ‘Stripes’, Cold in the tropical troposphere but it should be warming if Global Warming ”theories” are correct!, Assessment of the reliability of climate predictions based on comparisons with historical time series, Mera om Klimat modellernas falsarium, Klimatmodellernas falsarium, Klimatmodellernas skojeri – Fel på 100 – 300%! This article addresses new satellite and modeling evidence that previous satellite diagnoses of high climate sensitivity–which directly translate into predictions of dangerous levels of global warming–contain a large spurious bias. It is shown that those exaggerated estimates were the result of faulty assumptions regarding clouds when analyzing variations in average global temperature and average reflected sunlight off of the Earth. Specifically, it has been assumed (explicitly or implicitly) that, for global averages on time scales of three months or more, temperature variations cause clouds to change, but that cloud variations do not cause temperature to change. But when properly filtered, the satellite data reveal evidence of cloud variations indeed causing temperature changes, and that this source of natural climate variability biases the estimate of climate sensitivity in the direction of a very sensitive climate system. The new interpretation suggests a very low sensitivity. If the new sensitivity estimate is accurate, it would suggest only 0.5 deg. C of manmade warming by the year 2100. The new sensitivity estimate also suggests that warming over the last century can not be explained by human greenhouse gas emissions alone, but instead might require a mostly natural explanation. 1) Current satellite estimates of climate sensitivity have a spurious BIAS in the direction of HIGH SENSITIVITY. (2) This bias is probably due to small, natural fluctuations in cloud cover causing contamination of the true climate sensitivity signal. (3) The true climate sensitivity only shows up during those shorter periods of time when non-radiative forcing (e.g. evaporation) is causing a relatively large source of temperature variability, compared to that from cloud variability which ”tries” to push the diagnosed line slope toward zero (borderline unstable climate system). Klicka på graferna så blir de större. Fig. 3. As in Fig. 1, but now the hypothetical data are ”noisy”, as in real satellite measurements. Fig. 4. Weekly global oceanic averages of total radiative (reflected solar plus emitted infrared) flux changes measured by NASA’s CERES instrument on the Terra satellite, and corresponding tropospheric temperature measurements made by the AMSU instrument on the NOAA-15 satellite. Fig. 9. 91-day global oceanic averages of total radiative (reflected solar plus emitted infrared) flux changes measured by NASA’s CERES instrument on the Terra satellite, and corresponding tropospheric temperature measurements made by the AMSU instrument on the NOAA-15 satellite. See above text for details about how cloud variability causes a contamination of the true feedback (climate sensitivity) signal. The prediction of how much manmade global warming we will see in the future (as well as how much past warming was manmade) depends upon something called ”climate sensitivity”. For many years, climate researchers have struggled to diagnose the Earth’s climate sensitivity from measurements of the real climate system. It’s almost a ”holy grail” kind of search, because if we could discover the true value of the climate sensitivity, then we would basically know whether future global warming will be benign, catastrophic, or somewhere in between. Here I present a new method of satellite data analysis which I believe reveals the climate sensitivity, and I also show why it has been so hard to diagnose from observations. When the Earth warms, it emits more infrared radiation to outer space. This natural cooling mechanism is the same effect you feel at a distance from a hot stove. The hotter anything gets the more infrared energy it loses to its surroundings. For the Earth, this natural cooling effect amounts to an average of 3.3 Watts per square meter for every 1 deg C that the Earth warms. There is no scientific disagreement on this value. Climate sensitivity is how clouds and water vapor will change with warming to make that 3.3 Watts a bigger number (stronger natural cooling, called ”negative feedback”), or smaller (weaker natural cooling, called ”positive feedback”). While there are other sources of change in the climate system, cloud and water vapor changes are likely to dominate climate sensitivity. The greater the sensitivity, the more the Earth will warm from increasing atmospheric greenhouse gas concentrations being produced by humans through the burning of fossil fuels. 1.) If clouds and water vapor don’t change as we add CO2 to the atmosphere, then the expected warming by 2100 would only be about 1 deg. C, which would not be a very big concern for most people. This is called the ”zero-feedback” case. 3.) If the climate modelers are wrong — and low clouds increase, high clouds decrease or water vapor decreases with warming — then the effect will be to reduce the warming to less than 1 deg. C. For instance, if that 3.3 Watts of natural cooling mentioned earlier increased to as much as 8 Watts from cloud changes, the warming would be reduced to about 0.5 deg C by 2100. This is called the ”negative feedback” case. To have any hope of figuring out the Earth’s climate sensitivity, we must examine natural variations in the climate system for clues. For example, do clouds tend to increase with warming, or decrease? Our interpretations of these relationships find their way into the climate models, so that the models will hopefully behave like the real climate system. Some researchers, like NASA’s James Hansen, believe we can examine clues in the geologic record to estimate climate sensitivity …but I don’t. We have a difficult enough time with our high-tech instruments on satellites covering the whole Earth and making direct measurements every day, and yet the climate sensitivity Holy Grail has still eluded us, so I don’t see how we can reliably interpret any indirect clues from the geologic record. We need 3 kinds of observations to estimate climate sensitivity. When the Earth warms from natural climate variability, Earth-orbiting satellites measure how much the infrared radiation escaping from the Earth increases, as well as how much the reflected sunlight (a measure of cloud cover) changes as well. Global temperature measurements are also made by satellites. To make climate sensitivity estimates, we need to compare how global-average temperature variations compare to variations in the amount of radiant energy (emitted infrared plus reflected sunlight) lost by the Earth. These measurements are usually averaged for 3 months or more to get a single pair of numbers to compare. The increase in energy lost by the Earth per degree of warming during natural climate variability is believed to be a measure of the climate sensitivity. Researchers typically plot these temperature and radiant energy variations on a graph, and analyze the results. For purposes of discussion, I will call these ”climate sensitivity graphs”. Fig. 1. Conceptual plot of how the Earth’s radiative cooling to outer space (vertical axis) changes with temperature (horizontal axis). 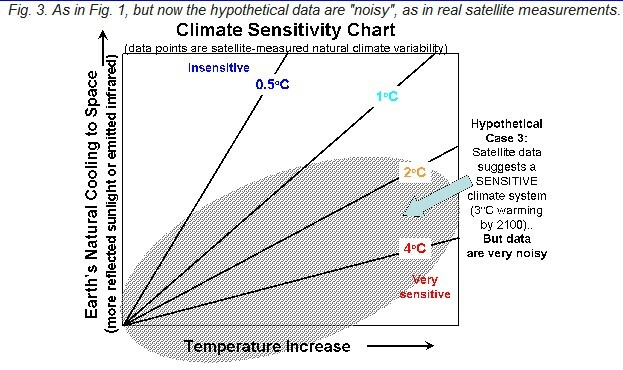 Four lines are drawn illustrating how hypothetical satellite observations of these two variables might align themselves on the graph for different ”climate sensitivities”. Each climate sensitivity line (also called a feedback line) is labeled with how much global warming might be expected by 2100 as a response to manmade greenhouse gases added to the atmosphere, for that climate sensitivity. 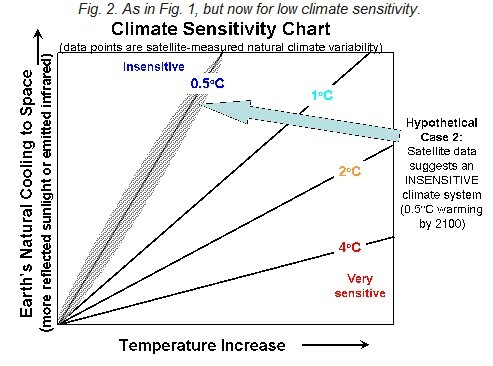 I have drawn different lines on the above chart that represent different climate sensitivities; I have labeled them in terms of how much global warming by 2100 each line corresponds to (assuming some level of future greenhouse gas emissions). Let’s think about what one of these lines means: let’s use the 0.5 deg C line as an example. That line has the steepest slope, which means for a certain amount of temperature increase, the Earth emits the maximum amount of extra radiant energy to outer space. (This increase in radiative energy could be from extra emitted infrared, extra reflected sunlight off of clouds, or both). Now lets pretend we have some actual satellite measurements to plot on the above graph, and it turns out they neatly align themselves along the 4 deg C line, as in Fig. 1 (above). This would suggest the climate system is VERY SENSITIVE, and that not very much extra energy is being lost to outer space for a certain amount of warming. What this would mean for global warming is that, in response to the extra infrared trapping by the extra carbon dioxide we are putting into the atmosphere, the Earth will require a LARGE temperature increase in order to restore balance to the radiant energy flows in and out of the Earth (”in” meaning absorbed sunlight, and ”out” meaning emitted infrared plus reflected sunlight). Now let’s assume that the satellite measurements of natural climate variability neatly cluster along the 0.5 deg C line, which is shown in Fig. 2 (below). Fig. 2. As in Fig. 1, but now for low climate sensitivity. In this case, the data suggests that the climate system is INSENSITIVE, that is, a certain amount of trapping of infrared energy by our greenhouse gas emissions will only cause a small increase in temperature to restore radiative balance of the Earth. In this ”noisy data” case we see that the data seem to be somewhat aligned along an imaginary line between the ”2 deg.” line and the ”4 deg.” line, let’s say 3 degrees. But since the data do not form a nice, neat line there is quite a bit of uncertainty – this is more like the case with real satellite data. And, unfortunately, nature is even more complicated than this. Typically, depending upon what years we analyze data from, we get different clouds of points seemingly aligned along lines of different slopes. Some researchers interpret this to mean that climate sensitivity actually varies between different values. And to make matters even worse, we don’t have very much real satellite data to plot. Since there are only 4 totally independent data points per year (one data point every 3 months) to plot, and at best there are only about 20 years of satellite data to analyze, there are at most 80 data points to plot. We would prefer to have hundreds or thousands, but our satellite data record is still pretty short. Now let’s explore why, in my opinion, the real satellite data have been so ambiguous. As we will see, researchers have been misinterpreting what Mother Nature has been trying to tell us. We see that the data do tend to cluster along an imaginary line, and the slope of that line is 4.5 Watts per sq. meter per deg. C. This would indicate low climate sensitivity, and if applied to future global warming would suggest only about 0.8 deg. C of warming by 2100. Now, it would be nice if we could just stop here and say we have evidence of an insensitive climate system, and proclaim that global warming won’t be a problem. Unfortunately, for reasons that still remain a little obscure, the experts who do this kind of work claim we must average the data on three-monthly time scales or longer in order to get a meaningful climate sensitivity for the long time scales involved in global warming (many years). OK, so let’s average these data at 3-monthly time scales, which is shown in the following graph (Fig. 5). Fig. 5. As in Fig. 4, but now for 91 day averages. Now, we see that our 4.5 Watt line has suddenly turned into a 0.6 Watt line, which is a very high climate sensitivity – about 6 deg. C warming by 2100. Obviously, this is a very different story from the weekly averaging, which gave us a very low climate sensitivity. How are we supposed to interpret these very different results? First, notice how ”poorly behaved” the data are in Fig. 5. They don’t cluster along the line very well at all. This is one reason why a few researchers have published papers saying not to trust this method of estimating climate sensitivity. Nevertheless, the climate modelers still use it to validate their models. In fact, much of the the data in Fig. 5 seem to be arranged along a number of lines of much steeper slope, which I have indicated with the 4 thin lines I have drawn on the graph. What does all this mean? These linear striations in the data were an accidental finding of mine. I was computing these averages in an Excel spreadsheet that had daily averages in it, so the easiest way for me to make 3-monthly (91 day) averages was to simply compute a new average centered on each day in the 6-year data record. But it turns out that when you do this, you get to see how the averages evolve in time. They form long, snake-like patterns (see Fig, 5), with adjacent dots representing adjacent days. Each of those linear features represent different sub-periods of time in the satellite record which are indicating a different slope…about 8 Watts per sq. meter per deg. C. But why do the linear clusters of points spread out horizontally like that, all together giving the impression of a very sensitive climate system (only 0.6 Watts per sq. meter per deg. C)? We will find out shortly. In order to answer questions like these, it is useful to build a climate model. While the climate models you hear about in the news represent a huge collaborative effort among many scientists and years of work, you might be surprised to learn that they still do not produce more accurate warming estimates than the simplest of climate models — at least not for a global-average warming. In fact, the global warming problem can be approximated with a single equation with only three terms. I will express that equation with the following description: (1) the change in temperature with time of the climate system is equal to (2) a net heating or cooling term plus (3) a feedback term representing the climate sensitivity. In fact, if I know the climate sensitivity (a coefficient in the feedback term) then I can make just as good an estimate of global warming with this one equation as can a state-of-the-art, multi-million dollar climate model running on a supercomputer. I created such a simple model in an Excel spreadsheet. In the following graph we see a climate sensitivity chart for a model forced with only radiative forcing (representing, for instance, changing amounts of low cloud cover letting variable amounts of sunlight in). Just as I did for the real satellite data in Fig. 5, I have plotted 91-day averages for every day from the 85 years model run time. I have also specified a total feedback parameter (which is related to a specific climate sensitivity) of 6.0 Watts per sq. m. per deg. C in the model run. Fig. 6. As in previous graphs, but now the data come from a simple climate model forced only by variations in cloud cover and run for 85 years of model time. The feedback slope specified in the model is 6 Watts per sq. m. per deg. C.
Significantly, note that the feedback parameter line fitted to these data is virtually horizontal, with almost zero slope. Strictly speaking that would represent a borderline-unstable climate system. The same results were found no matter how deep the model ocean was assumed to be, or how frequently or infrequently the radiative forcing (cloud changes) occurred, or what the specified feedback was. What this means is that cloud variability in the climate system always causes temperature changes that ”look like” a sensitive climate system, no matter what the true sensitivity is. This is a very significant result…it isn’t entirely new, since at least one previously published paper suggested it, but the authors of that study did not appreciate its importance. Now, lets force the model with only NON-radiative heating variations, such as might occur from changing amounts of evaporation from the model’s water surface (faster evaporation causes a lower temperature). In this case (graph below in Fig. 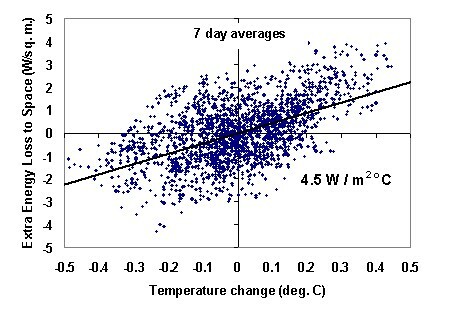 7), we see that the data fit neatly along a line with the correct slope (correct climate sensitivity). Fig. 7. As in Fig. 6, but now the model is forced with NON-radiative variations in cooling of the ocean (such as through evaporation). The only difference between these two graphs (Figs. 6 and 7) is that one involved RADIATIVE forcing (such as from varying cloud cover), while the other involved NON-radiative forcing (such as from evaporation). Fig. 8. As in Figs. 6 and 7, but now the model is forced with both radiative and NON-radiative variations in cooling of the ocean (such as through cloud variations AND variations in evaporation). We ALSO see that the diagnosed slope (1.7 Watts per sq. m. per deg. C) is far from that specified in the model (6.0 Watts per sq. m. per deg. C) — specifically, the diagnosed sensitivity is BIASED in the direction of high climate sensitivity (toward zero) even though a very low sensitivity was specified. Significantly, note that we also begin to see in Fig. 8 a tendency for some of the data to align themselves along the parallel lines representing the true feedback. Thus, this model analysis (Fig. 8) supports the new data interpretation (Fig. 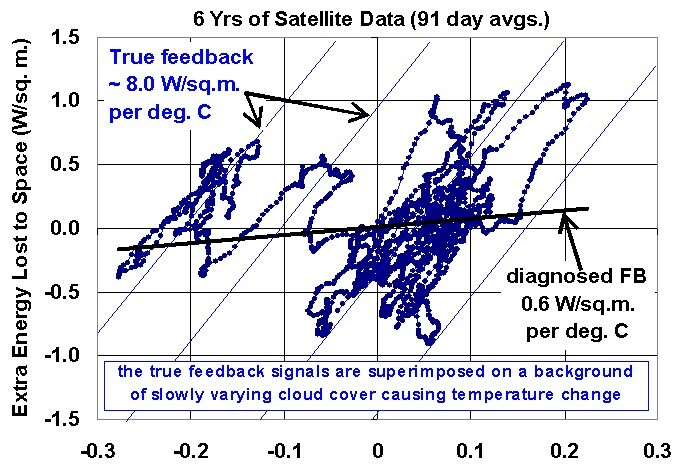 9, below) that the true feedback signal appears during certain sub-periods of time in the 6-year satellite record which is superimposed upon a slowly varying background of cloud-forced temperature change. It is that background signal for which we can not diagnose a feedback (see Fig. 6 again)…it instead contaminates and obscures the true feedback signal, spuriously biasing it in the direction of high climate sensitivity (low feedback number). Now let’s use what we’ve learned from the model in our interpretation of the satellite observations, which I have reproduced in Fig. 9. The linear striations we saw (I call them ”feedback stripes”) represent the true signal of feedback (climate sensitivity) in the climate system. In that case, those feedback stripes are aligned along a line slope with the astonishingly high value of 8 Watts per sq. m. per deg. C. This is stronger negative feedback (lower climate sensitivity) than I think anyone has ever dreamed possible. If applied to the estimation of manmade global warming, it would result in only about 0.5 deg. C (less than 1 deg. F) of warming by 2100. It still might be legitimately claimed that this strong negative feedback seen in the satellite data on short time scales might not apply to the long time scales of global warming. But our understanding of climate sensitivity will ALWAYS be limited to a short satellite data record, so the same can be claimed of any climate sensitivity estimates. After all, the data in Fig. 9 are 3-monthly averages, which others have assumed to be sufficiently long to diagnose climate sensitivity. Now, let’s turn to what this means for climate modeling. Since climate models are constructed based upon our understanding of ”what causes what” to happen in the climate system, they have probably been constructed based upon a misunderstanding of how the climate system operates. We already know that ALL 20 models used by the Intergovernmental Panel on Climate Change (IPCC) have higher climate sensitivities than our best estimates from satellite data, even without this new interpretation of the satellite data. Why is this? I believe that it comes down to a basic misinterpretation regarding cause and effect: Climate models have been built with natural climate variability as a guide, during which it has been assumed that observed temperature variability caused the observed cloud variability. But since causation also flows in the opposite direction (cloud variability causing temperature variability), the climate models have a built-in bias toward high climate sensitivity, and so they produce too much global warming. Furthermore, there is a very important implication of what I have presented here for the PAST warming we have observed, that is, the approximate 1 deg. C warming over the last 100 years. IF the climate sensitivity really is low (somewhere approaching the feedback parameter of 8 Watts per sq. m. per deg. C estimated here) then manmade greenhouse gas emissions are NOT SUFFICIENT to explain the observed warming in the last 100 years. You see, we know that the extra CO2 we’ve added to the atmosphere has caused something like 1.5 Watts per sq. m. of additional trapping of infrared energy in the climate system, but that is nowhere near enough to cause a 1 deg. C warming if the climate system is that insensitive. One would need to find some additional, natural source of warming. And the most likely culprit? A small change in cloud cover. The question is, then, Have there been natural changes in cloud cover (only about 1% would be needed) in the last 100 years which have caused some, or even most, of our warming? Unfortunately, we may never know, simply because our observations of global cloud cover are nowhere near long enough, or good enough. Finally, what I have presented above represents both empirical and theoretical evidence for what many people (meteorologists and laypersons alike) have been wondering for a long time…. This entry was posted on 30 juni, 2008 at 6:27 e m and is filed under Miljö - Environment. You can follow any responses to this entry through the RSS 2.0 feed. You can leave a response, or trackback from your own site.